Huis met zwembad en mooie grote tuin in een rustige wijk. Het huis ligt in een rustige woonwijk met een heerlijk zwembad in een mooie grote tuin . Het ligt 10 min met de auto van de kust en Salou,Tarragona, Cambrills zijn ook snel bereikbaar. Ook ben je met 1 uur rijden in Barcelona. De eigenaars zijn erg vriendelijke en behulpzame personen. Maar het huis is echt aan renovatie toe, geen airco waar deze vakantie echt behoefte aan was,zeker in de nachten. Wel op elke kamer een ventilator, maar dat was niet voldoende. Esta situada cerca de centro comercial Mercadona y otros supermercados. Hay una playa cerca a 10 minutos en coche, playa larga. Playa tranquila con chiringuitos para comer o tomar algo . La casa no está a la última pero se dispone de todo para estar cómodo en ella. A destacar, cuidado con los mosquitos, aunque la casa dispone de mosquiteras por toda la casa, hay bastantes sobre todo a partir de la 18:00. BELLE ENDROIT ET JOLIE MAISON!! Nous avons baeucoup joui, la maison avait tout, qu'il dit la web. La propriétaire est très agreable, nous a donné tout information où aller, et manger....et lieu pour visiter. 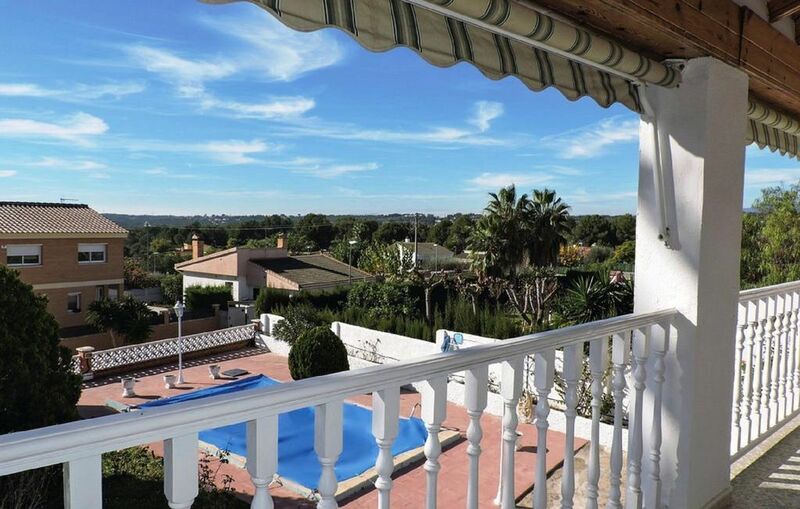 We had a lovely two week stay at this villa during the sizzling summer heat of the Spanish Sun! Luckily the villa has a fab pool area to cool off in where we spent many pleasant days relaxing and sunbathing! The villa is in need of some modernisation but was perfectly adequate for our party of 9 with four bedrooms and a bathroom upstairs and a bedroom downstairs with separate bathroom which was handy for my disabled mother. The owner Rosa and her son were happy to help with any questions or problems we had during our stay. The villa is situated in a small quiet estate -there is some occasional noise from dogs in the surrounding villas but we have experiemced that elsewhere in Spain too. The villa is only 15 mins drive away from big supermarket shops and there is also a perfectly well stocked spa supermarket in the local village only 5 mins drive away. A car is essential though to get the most of the holiday and we had some great trips to local places such as Tarragona with its rich Roman history and we especially enjoyed the old town and its amazing narrow streets to explore. Salou is also a big tourist town with typical sea side type shops a great beach and long sea front Palm tree lined promenade. We also took advantage of only being 15-20 mins from Port Aventura theme park and water park which is brilliant for kids and thrill seekers alike! We also took the high speed train one day to Barcelona from Camp Tarragona station which was ten mins drive from the villa and made it a nice easy stress free journey to this vibrant city filled with Gaudi treasures! The Hop On Hop off buses are a great way of seeing all the best sites! Overall we thoroughly enjoyed our holiday at this villa and made the most of our time in the Spanish sun!